In Vegas, the Game of Thrones slot game has been a massive hit. The game has lots of movie clips and huge screens with an enormous number of bonus games to explore. Like a lot of the big movie brand slots out there, don't expect to make money playing this one, but do expect to have a wonderful time enjoying the fun. Game of Thrones is a 5x3 reel slot machine with 243 paylines produced by Microgaming. Its theme is based around the popular TV show with the same name, and a book series called A Song of Ice and Fire that inspired the TV show. Rather than having a focus on characters, it instead focuses on the four great houses that are important in the show, as it uses a mixture of poker card symbols and house crests as icons on the playing field. 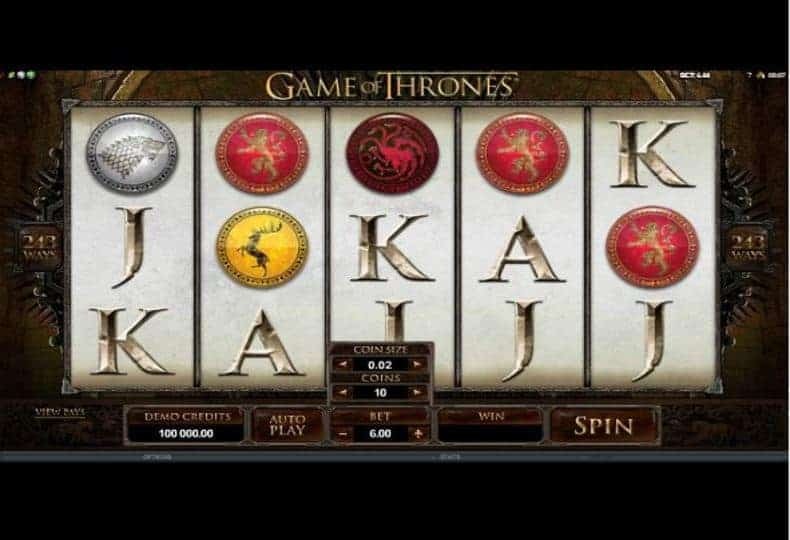 The main feature of Game of Thrones is the free spins bonus. Getting three or more Scatters will activate the special feature. The amount of spins and multipliers you get depends on your choice of house, as Baratheons give the least amount of free spins but the highest multiplier, and the Targaryens give the most free spins, but the lowest multiplier. The Starks and Lannisters sit in the middle, as a mix between the two extremes. Another bonus is a cash prize if you get only two Scatters on the playing field, which acts as a consolation prize for missing out the free spins special feature. Alongside this, a coin flip mechanic that allows you to double up your winnings up to four times if you make the correct guess. Game of Thrones offers medium volatility gameplay, as it mixes small wins and bigger ones that remain locked behind the bonuses that it offers. It is possible to reach a huge win, but it requires a lot of luck that will probably make the news. The slot offers a 95% RTP. The great game has not escaped the colonies, so New Zealand and Australia will also have to declare their allegiance to one overlord or another in this pokie. And as the country that has inspired the story itself, this fruit machine is available in the United Kingdom. It's not surprising that the game is such a hit, when you consider how the TV show has grown to become one of the biggest ever produced. The slot game had to be built to match that type of excitement and power.